This is my first blog of the new year - my daughter has told me off for not keeping it upto date! 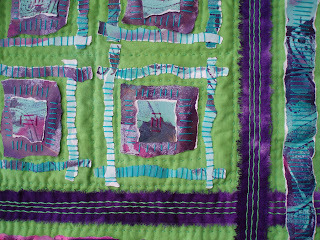 To the left is a mixed media quilt - I have used my decorated papers, dyed fabrics using dyrect dyes in the microwave and simple stitches to put it together. It is featured in the latest isse of the American magazine Cloth, Paper and Scissors. If you would like to do a workshop on subject I will be teaching at the Cottenham [Cambs] textile weekend on 17.02.08. Also I am giving a talk at Sevenoaks in Kent this Saturday [26.01.08] and in the afternoon session there will be the opportunity to have a go!